I’m at the TCAs right now, and yesterday there was a question for a panel on yet another time travel show, ABC’s Time After Time. A few questions were brought up about the prevalence of time-travel series right now, and the producers pointed to the fun of the fantasy aspect. But, they pointed out, there are always rules in time travel. Each of these shows kind of establishes their own rules, but there’s a prevalent feeling that if you mess with timelines too much, time itself will begin to unravel. Another rule is that every action has to have a reaction. You can mess with something in the past, but it still may not have the effect you want in the present (got that, The Flash?). Frequency’s premise is wedded to this butterfly effect, that Frank and Raimy are working, 20 years apart, to the same end to bring down the same man, Deacon Joe, who they believe to be the Nightingale. For these previous 10 episodes, the show has fairly straightforwardly explored these dueling timelines, so that when a man dies in traffic in front of Frank in 1996, he disappears in front of Raimy 20 years later. It can be confusing, so that’s why these rules are set up. This episode, Frank has to turn into a predator himself to go after the supposed Nightingale when he escapes from that car accident. Then, at about the halfway mark, the episode shifts completely, but in such a subtle way that it takes a while to sink in. Deacon Joe is still alive. Raimy’s lawyer disappears. She has her gun and her badge back. The body of Deacon Joe’s wife is no longer in the closet upstairs. Raimy then goes on at great length to explain to Frank why the timeline changed, so that in this new reality, she never killed Deacon Joe, but it’s way too long and convoluted. I’ve watched this episode a few times now, and if you have to take about eight steps to get your logic where it needs to be, it’s a bit too much. Also not adding up: Satch’s loyalty to Stan because of the domestic violence incident years ago. If that crazed husband almost killed him, how could Satch get into trouble when he fell off the roof? Why would he need Stan for backup? Also: Who’s in the big truck that nearly drove Raimy off the road? And then why does that truck disappear? Is it because the guy in the truck was the Deacon, but now he’s in prison? But didn’t the truck thing happen before Frank set the Deacon up? Julie offers Frank his family back if he just won’t go through with killing Deacon Joe, even though modern-day Raimy believes that’s exactly what he needs to do to keep his family intact. It could be the sage advice of Satch that does it: “Whatever you’re dealing with, it’s just not worth risking everything that you have.” So Frank sets him up with the stolen church money instead. Still on shady moral grounds, but not the same as murder, obviously. Somehow, this leads to Meghan’s brother being alive in the present. That’s a lot of loose ends with only two episodes left in the season: the truck, the duffle bag, the brother. The fairly straight paths we’ve been dealing with have taken some unrecognizable twists. 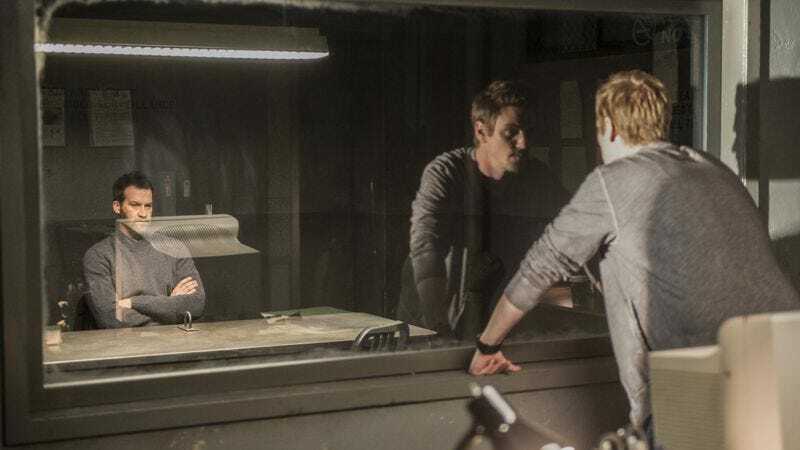 With the second season fate of Frequency also still up in the air, it seems like an almost insurmountable challenge, but let’s see how these next two weeks play out. There’s an interesting message in what Frank did, however, basically coming from Julie. He can manipulate things in the past all he likes, and then hear from Raimy how they affected the present. What he can’t know is how all these machinations will affect him. If he does become a killer, Julie fears that this will change him irrevocably, and in the end Frank decides that she’s right. But we still don’t know what the ramifications are of leaving Deacon Joe alive. So Gordo’s father actually comes in handy as Raimy’s lawyer. Glad to see there was a bona fide reason to bring him in. In our boring love triangle sweepstakes: Mosby, actually being handy by running some license plates for Raimy; Daniel, not so much, but at least he broke up with his fiancee finally. Do we still think Deacon Joe is the Nightingale? He of course seems pretty adamant that he is not, and what could Meghan’s messes be that he was talking about? It’s not like this show doesn’t have creepy guys who aren’t named serial killers (like the one who locked up girls in his shed). Ha, references to the movies of ’96: Twister and Bridges Of Madison County. Anybody else worried about the church lady who came in for some tea? How in the world did Julie get Frank a new car? Sorry for the lateness of this review: Like I mentioned above, I’m out at the TCAs in L.A., where The CW announced the renewal of several shows, but not this one (No Tomorrow is also still outstanding). Two more episodes! Let’s see what happens!